WASHINGTON, DC -- In Ukraine the ceasefire that was supposed to go into effect September 1 has since been broken by a number of small arms attacks by Ukrainian and Russian-backed separatist forces in the east, according to a report issued by the Ukrainian government. 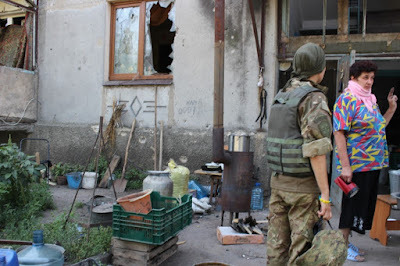 A woman speaks to a Ukrainian soldier outside of her basement dugout in the village of Pisky, Ukraine, Aug 2015. Early Wednesday two civilians were killed and six Ukrainian soldiers were wounded when an anti-smuggling operation was ambushed near Luhansk in eastern Ukraine. Later in the night, both Ukrainian troops and Russian-backed separatists traded fire near the Donetsk airport. The two sides agreed upon the now-violated ceasefire in conjunction with Ukraine’s first day of school, but its breakdown should come as no surprise. The original ceasefires signed in September 2014 and February 2015, known as the Minsk agreements, broke down immediately after their implementation. The attacks come just days after protests in Kiev. Monday sparked the worst violence the city has seen since the Euromaidan protests last year. The turmoil was in direct response to a vote by the Ukrainian parliament to give separatist controlled areas more autonomy. The protests turned bloody when a disenfranchised ultranationalist soldier threw a grenade into the crowd gathered outside of the parliament building downtown. The initial blast killed one national guard soldier. Two additional police officers died in the hours following and more than 90 people were wounded. The vote for decentralization and more autonomy in the east will allow the occupied territories to re-enter the Ukrainian system through diplomatic means, according to President Petro Poroshenko. Decentralization measures are also one of the stipulations of the Minsk ceasefire agreements. According to the AFP, the European Union is set to extend sanctions on Russia for continued backing of the separatists fighting in the east. While not yet official, the vote is set to go through September 15. Elsewhere in the country, the ceasefire seemed to hold following the isolated incidents elsewhere on the front. The conflict, which is into its second year, has claimed the lives of almost 7,000 people. For those living on the front, the war has brought widespread suffering and misery. To flee the fighting thousands have had to leave their homes. For some, however, financial and familial burdens have forced them to stay in villages that are shelled constantly. “I never expected such a war could happen,” said Sveta, who was afraid to reveal her last name in case the town was ever recaptured by the separatists.